Everyone&apos;s in the holiday spirit and the wineries along the Mason-Dixon Wine Trail are no exception. It&apos;s the perfect time of the year to take a holiday excursion to any of the 17 family-owned wineries along the trail and pick up something special for the wine lover on your list. You&apos;ll find festive wine selections perfect to give as a gift or to pair with your holiday meal. Here are five wines to make your holiday season a little brighter. Naylor Wine Cellars jokes that the Sugar Plum Fairy visits around December, bringing a wine that&apos;s become a holiday tradition here in York County. Of course, we&apos;re talking about Naylor&apos;s Sugar Plum Wine, a sweet fruit wine that&apos;s available only for a limited time. Now&apos;s the time to stop by the winery or Naylor&apos;s outlet store to pick up a bottle - or risk missing out until the fairy returns next year. But just in case you do, Naylor Wine Cellars also makes a classic Holiday Spice wine perfect to serve warm during your holiday dinner. 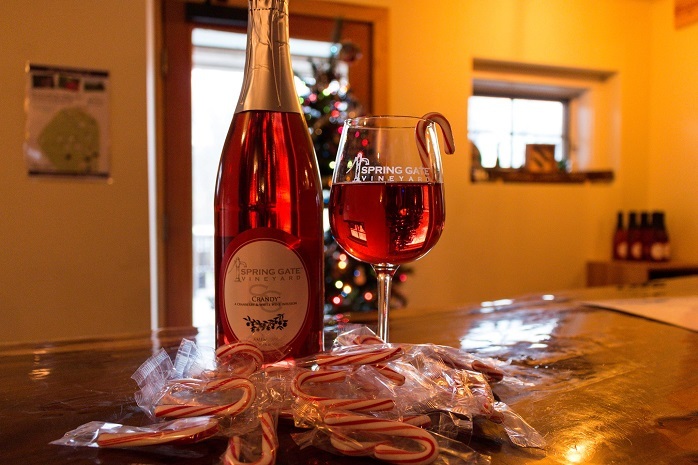 Mount Hope Winery&apos;s new-for-the-holiday-season offering is a can&apos;t-miss for chocolate lovers. Combining the classic flavors of rich chocolate and refreshing mint, the Winter Mint Chocolate Wine is a sweet red blend that can be served on its own or mixed into dessert recipes, according to the winery. Mount Hope notes it also pairs well with lamb or chocolate desserts, so pick up a bottle and pop the cork as you gather around the table this holiday season. It&apos;s hard to go wrong with a wine that&apos;s called "Christmas in a bottle." That&apos;s exactly how Logan&apos;s View Winery describes its Sassy Spice wine, a sweet red that features flavors of cinnamon, cloves, nutmeg and a hint of lemon. Stop by the tasting room at Brown&apos;s Orchard and Farm Markets to pick up a bottle. It&apos;s perfect as a gift, too! This year, forget the cranberry sauce and go straight for the Crandy Wine at Spring Gate Vineyard & Brewery. This sparkling wine infused with cranberry takes a quintessential holiday flavor and puts it in a glass. According to Spring Gate, the sweet wine pairs well with chicken and other holiday fare. The winery also makes a new Crandy Apple Wine and Cranberry Cider also fitting of the season. Fiore Vineyard&apos;s Scarlette - a semi-sweet bursting with full grape flavor - becomes an instant holiday classic by adding just a few simple ingredients. Grab some apple cider, brown sugar and one bag of mulling spices, mix it with the wine in a crockpot and slowly heat it for a festive mulled wine. You can find that recipe and others on Fiore&apos;s website. All of these wines make a perfect gift for the wine lover in your life, but you can really make their Christmas morning by filling a stocking with tickets to Tour de Tanks, one of the Mason-Dixon Wine Trail&apos;s signature events. Coming up this March, visitors can enjoy tastings at every winery on the Mason-Dixon Wine Trail over four weekends, plus enjoy behind-the-scenes tours and other educational presentations all for just $30. For tickets, please email marketing@yorkpa.org.